During the water months are skin has a tendency to become dry, overloaded and often pigmented due to sun and sea exposure; the result is a complexion that’s less than glowing if you don’t look after it. Pixi are well known for their iconic Glow Tonic, which helps to gently slough away dead and dull cells from the surface of skin to reveal a much fresher and more supple looking face beneath, but this extension of that concept will surely become just as popular. Utilising natural fruit enzymes, sugar extracts and lactic acid, Peel & Polish gently exfoliates dead skin cells to reveal a smoother and more refined complexion, while restoring a healthy bright glow. Applied as a face mask for a few minutes in the morning or evening, it helps to give your skin a boost – while the small exfoliating particles within the creamy formula provide additional gentle manual buffing. It smells amazing and leaves my skin feeling fabulous. I’m not one to usually be that impressed with Bliss skincare (a lot of the time I personally think it’s overpriced and under-delivers,) but this tube of moisturiser had me at the first pump. The formula is incredbly light and creamy, effortlessly sinking into the surface of skin to leave a subtle glow while providing serious amounts of care and protection too. It contains a plethora of ingredients to help restore and maintain a healthy glow: Vitamin C helps to clarify, protect and revitalise skin, Green Tea Extract helps protect skin from sun damage (the biggest cause of premature ageing,) Grapeseed Extract helps prevent the degradation of collagen and elastin (essential for a plump and youthful glow,) Mulberry Root Extract helps to protect skin from free radicals that cause skin degradation, while White Lily Extract helps to soothe and hydrate for brighter skin. A great all-rounder that’s travel friendly too. I saw a preview of this when I visited the L’Oreal Skin Labs over a year ago, so I was delighted to find that this was finally hitting UK stores. Perfectly suited for the summer months when none of us want to overload our skin with sticky products and endless layers, this is used instead of your usual moisturiser and locks in moisture for up to 72 hours. Enriched with Aloe Water (known for its ability to hydrate and soothe) and Hyaluronic Acid (essential for a hydrated and plump complexion), it instantly refreshes skin while absorbing fully into the surface within seconds. Although designed to be used after serum in place of a moisturiser, there’s no reason why you can’t use it as an essence to give skin a hit of moisture before your usual skincare, or as a refresher throughout the day if you’re sitting in the sun. A firm favourite and less than a tenner! 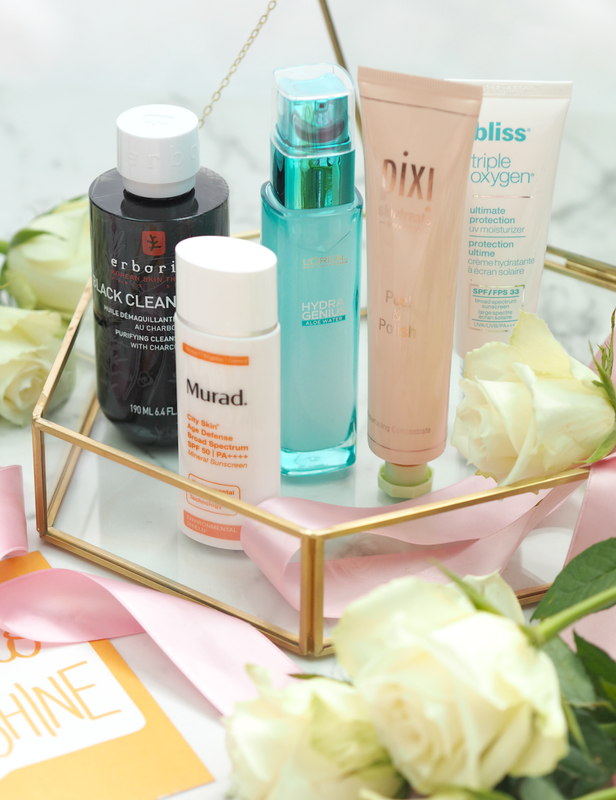 Definitely one of my ‘go to’ brands when I need to recommend serious skincare that works, whatever your issue, Murad are stars if you’re concerned with the signs of ageing or the damaging effects of the sun. Sunscreen is essential every day of the year, but in the summer months I opt for something a touch more hardworking that I know can rely on to maintain my glow. This incredibly effective formula boasts 100% mineral broad spectrum PA++++ and SPF 50, which protects skin from UVA/UVB rays, infrared radiation, pollution and blue light from electronic devices (like our laptops and smartphones.) It’s lightwight and a pleasure to apply, leaving behind a silky surface and absolutely no greasy residue – meaning you can wear it alone (thanks to the subtle peach tint) or layered beneath your usual makeup. A dose of Vitamin C visibly brightens skin too, ensuring your skin will keep looking fab all summer long. You know how much I love a cleansing oil, and you know how much I love a Korean skincare trend, so this bottle of greatness is firmly up there on my list of things I’m loving right now. Uniquely black in colour, this cleansing oil is enriched with charcoal (known for its purifying properties) to offer radiance and comfort while removing all traces of dirt and makeup from the surface of skin. As it transforms into a light emulsion when mixed with water, the elements of charcoal act like a ‘magnet’ to extract impurities from the surface (and beneath) to provide a thorough cleanse. Because it doesn’t dry the skin or leave it feeling tight, only leaving a clear and supple surface, the result is a complexion that definitely glows – and is ready for the rest of the steps in your regime. 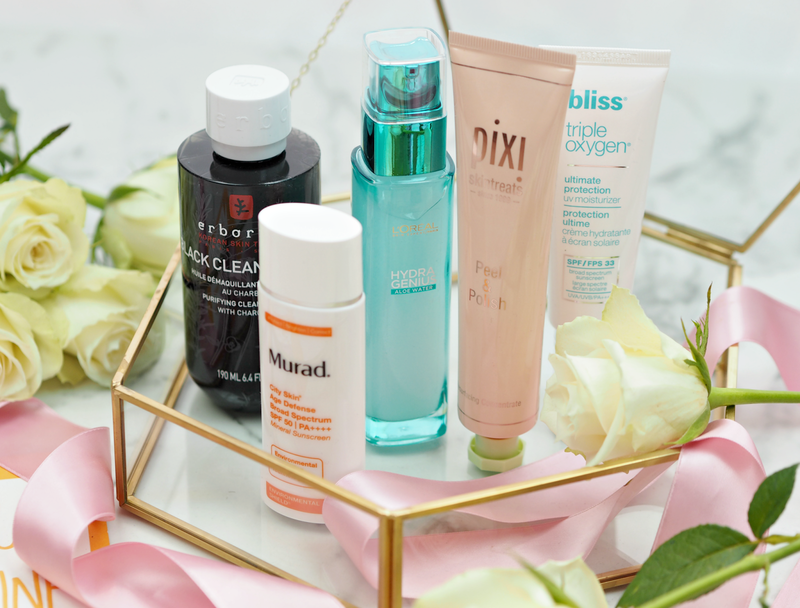 Have you tried any of these skincare gems? Do you have any summer faves for ensuring a glowing complexion? It's so great for summer – super light and easy to use with other layers. I haven't tried any of these. I really want to try the Murad and the Pixi products, they sound great. I have heard so much about the Pixi brand and their iconic Glow Tonic, I hope to try it one day. The black cleansing oils sound interesting too.